High quality kid's lab coat for playing dress up. Perfect for doctor, nurse and veterinarian costumes. Slim fit and made with a thick, cotton blend fabric. Machine wash and dry. 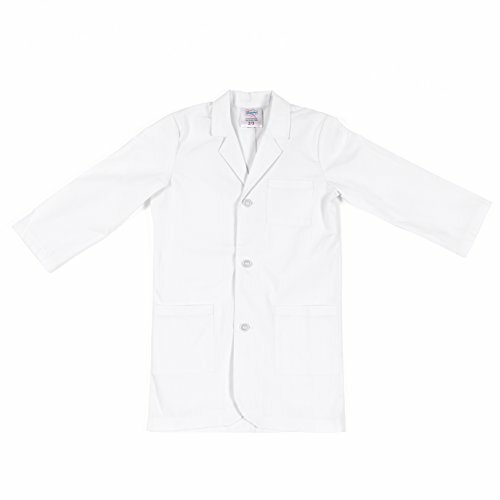 UNLIKE OTHER COSTUMES - Our lab coat is made with high-quality cotton fabric and stitching - just like the real thing! With a slim, but stretchy fit, our coat is miles above the usual halloween costume quality. HOURS OF ROLE PLAY FUN! Your child will be delighted playing dress up in our coat. With realistic details, pocket and soft fabric. Your little girl or boy will feel like a grown up in our outfit! LET YOUR LITTLE ONE TAKE CARE OF YOU - Encourage their imagination as they learn to help and develop concern for others - diagnosing and treating you, their friends pets or stuffed animals. Or maybe they will imagine being a scientist, developing new and exciting things! GIVE THEM CONFIDENCE FOR THEIR NEXT DOCTOR VISIT - Help them feel in control and confident on their next dr appointment by being able to role-play. Ease their fears by letting them wear and practice what the real doctor does. REST ASSURED WITH OUR GUARANTEE - Our customers are everything to us. We are a family run business with the goal is to provide quality toys to help children imagine, create and learn. If ever there is an issue with your costume please contact us so we can make it right. If you have any questions about this product by Big Imagination Co., contact us by completing and submitting the form below. If you are looking for a specif part number, please include it with your message.